Marcel Hirscher led an Austrian clean sweep in the slalom by winning by 0.65 seconds for a record-tying seventh career gold medal at the world championships. 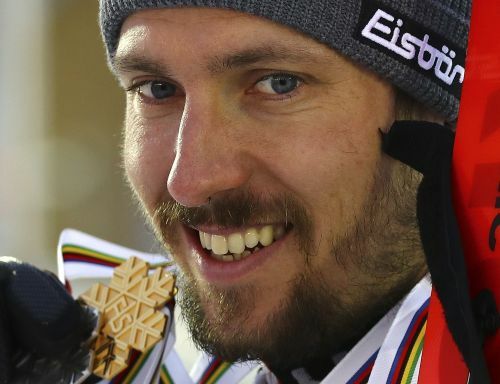 After producing what he said was one of the best runs of his career to get a lead of 0.56 seconds, Hirscher was able to coast to his third slalom win at a worlds — matching the record of the great Ingemar Stenmark. Michael Matt, the brother of former Olympic and world slalom champion Mario Matt, took silver and compatriot Marco Schwarz was third, 0.76 seconds back. The only other male skier to win seven career golds at the worlds was another Austrian, Toni Sailer, in the late 1950s. Hirscher has been suffering with a cold this week. He was second to Henrik Kristoffersen in the giant slalom on Friday. Marcel Hirscher took a 0.56-second lead in the slalom at the world championships in a brilliant response to missing out on gold in the giant slalom two days ago. Only Alexis Pinturault of France was within a second of Hirscher, who was on course to win a record-tying seventh career gold medal at the worlds. Marco Schwarz of Austria was in third place after the first run, 1.22 seconds off the lead. Henrik Kristoffersen, who beat Hirscher to GS gold on Friday, was 1.70 seconds back in sixth. Hirscher showed no effects from the cold that has been affecting the Austrian this week. Results weren't official as lower-ranked skiers were yet to finish. The second run starts at 2.30 p.m. (1330 GMT). Austria, a storied Alpine skiing nation, needs Hirscher to deliver in the final event to avoid finishing the world championships without a gold medal for the first time since Crans Montana, Switzerland, in 1987. The women's team has already finished with no medals and that hasn't happened since Schladming, Austria, in 1982. The conditions are overcast for Hirscher's tilt at the title. Mikaela Shiffrin defied illness to win the slalom at the skiing world championships. Can Marcel Hirscher do the same? If Hirscher wins the slalom for a third time, he will move on to seven career golds at the worlds — tying the men's record with compatriot Toni Sailer from the late 1950s.